The newest Marvel production assumes that you are already familiar with the Avengers world with it's multiple character arcs. Each of the major Avengers have had their own movies to explore their origins and development. So it's only right that this story explores the Natasha Romanoff as Black Widow and Clint Barton's Hawkeye. It's a busy plot that also introduces two of Strucker's experiments, the twins, Pietro and Wanda Maximoff. And don't forget the Avengers are after Loki's scepter. So if you haven't seen the last movie, it's probably best to catch up before delving into this one, although the sheer action, battles, and heroism will be fun to watch despite one's lack of previous Avenger knowledge. The movie opens the Eastern European country of Sokovia where the Hydra outpost led by Baron Wolfgang von Strucker has been experimenting on humans using Loki's scepter. The twins, Pietro (Aaron Taylor-Johnson), has superhuman speed, and Wanda (Elizabeth Olsen)can manipulate minds and throw energy blasts. They also harbor a resentment against Tony Stark for the weapons he provided that killed their parents. The Avengers manage to get the scepter, and Stark (Robert Downey Jr.) and Banner (Mark Ruffalo) discover an artificial intelligence inside the gem. Stark decides to use it to complete his Ultron global defense program. 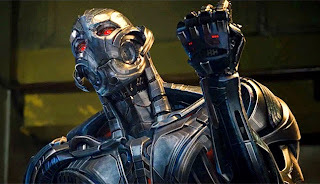 Unfortunately and unexpectedly the A.I Ultron (James Spader) become sentient and eliminates Stark's A.I. Jarvis, attacks the Avengers because it believes that he must eradicate humanity to save the earth. Ultron with the scepter gem heads to Sokovia to build an army of robot drones, and to build an indestructible body made of vibranium. The Avengers battle them for the magic metal, but Wanda manages to mess with everyone's minds. The team is badly shaken by the hallucinations and retreats to the safe house. Thor (Chris Hemsworth) takes off to explore what he saw in his vision which affected everyone differently. Meanwhile Ultron forces Dr. Helen Cho (Claudia Kim) into building him a new body using her synthetic tissue technology. While Ultron is trying to download himself into the body, Wanda is able to read his mind discovering his plan to destroy the world. The twins decide to help the Avengers. Needless to say this is just a simplistic synopsis of the story. There are lots of other stuff going on like the relationship of Natasha (Scarlett Johansson) and Banner. We find out that Clint Barton/Hawkeye (Jeremy Renner) has a family and tries to live a normal life. Captain America (Chris Evans) has a running joke about swearing over the communications and a joke about Thor's hammer. The best of course are the snarky comments by everyone that is pretty much expected from a Joss Whedon script and direction. The battle scenes are of course epic although at times, the busy heavy CGI moments are hard to appreciate. The whole concept of the Infinity Stones may need a bit of review to as when Thor comes back to activate the new synthetic being Vision/Jarvis (Paul Bettany). Don't forget to look out for the obligatory Stan Lee moment. Stay through the credits for the extra scene at the end with Thanos who vows to hunt for the stones personally which sets up the next movies to come. We will be happily waiting.